John Glen MP, Economic Secretary to the Treasury, has replied to MPs about our campaign to stop secret loans. We are calling for measures to ensure all loans to governments are public so that parliaments, media and civil society can hold borrowers and lenders to account. This follows a series of scandals where UK based companies have used UK law to give loans in secret to governments. John Glen’s answer does not directly respond to either point. Below are our responses to the substantive points that the Economic Secretary makes. 1) What the government says: The G20 continue to prioritise work on debt transparency and sustainability, with the July 2018 Finance Ministers and Central Bank Governors’ Communique stating: “we will work towards enhancing debt transparent (sic) and sustainability, and improving sustainable financing practises by debtors and creditors, both official and private”. What we say: It is welcome that improving debt transparency and sustainability is now on the G20 agenda, and this is partly thanks to our campaigning. However, this makes no concrete commitments on what G20 governments, or the multilateral institutions like the IMF and World Bank they control, will do. 2) In 2017, the G20 agreed Operational Guidelines for Sustainable Financing to promote transparent and sustainable lending to low income countries from G20 members. What we say: The 2017 Guidelines are a very limited commitment, which says that the G20 governments will notify the IMF if any of the loans G20 governments have given do not appear in a Debt Sustainability Analysis conducted by the IMF for the country concerned. This is limited because it only commits to sharing information on loans with staff of the IMF. This means civil society, media and national parliaments can be left in the dark. Even if the information is in some way subsequently included in an IMF Debt Sustainability Assessment, this could take two to eight years between a loan being given to the public knowing about it. Furthermore, there is evidence that the commitment is not being implemented. 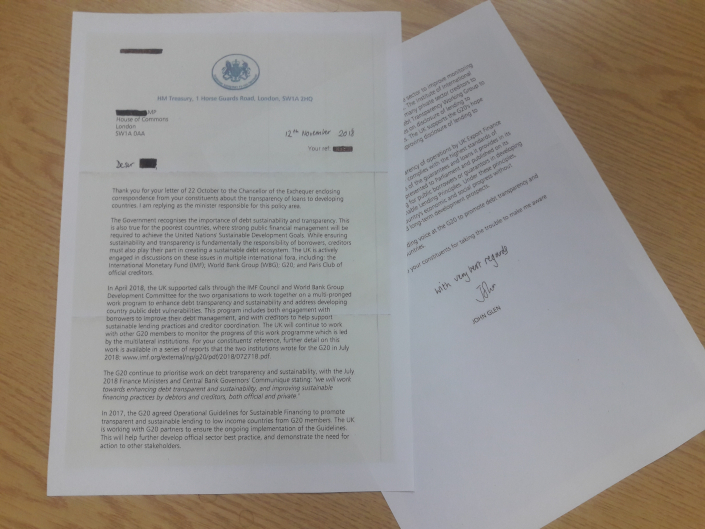 The UK government have told Jubilee Debt Campaign they do not regard it as creating any requirement for UK regulators to inform the IMF about loans from UK banks and companies, as opposed to loans from the UK government. But transparency of loans from private companies is vital. Loans from the private sector account for 60% of external debt of governments in the global South. 3) The Institute of International Finance has recently constituted a Debt Transparency Working Group to assess the feasibility of developing voluntary principles on disclosure of lending to sovereign nations, particularly low-income countries. What we say: This is a welcome step forward by private banks, as opposed to governments. It may lead to some banks disclosing the loans they give to governments. However, it is a voluntary scheme to disclose information on loans which has not been agreed yet. The Institute for International Finance only covers banks, not other lenders such as commodity trading companies. “mandatory rules, in alliance with other financial centres, to require all UK-based companies, and all loans given under UK law, to be publicly disclosed when they are given”. John Glen does not respond directly to this point. 4) What the government says: UK Export Finance … publishes details of the guarantees and loans it provides in its Annual Report and Accounts … which are published on its website. What we say: The UK Export Finance Annual Report is only published 3 months after the financial year it refers to. Therefore, it can take 15 months for a UK Export Finance loan to a government to become publicly known about. However, for this information to be used by parliaments, media and civil society to hold borrowing and lending to account, it needs to be published within one month of the loan being given. Moreover, the private sector scheme the UK government welcomes above is discussing loans being published within 1-2 months. The UK government should be leading the way, not lagging behind. Finally, if information is only published on the website of the lending bank or body, it is useless for accountability, as information on different loans will be spread across the internet. One place is needed where loans from all bodies – governments, companies and institutions like the IMF and World – are disclosed. 5) The UK will continue to be a leading voice at the G20 to promote debt transparency and sustainability in low income countries. What we say: This is a welcome commitment, though we have not yet seen any commitment by the UK to lead the way in practise – whether that is improving disclosure of its own loans, or regulating loans given under UK law so that they are disclosed. Moreover, the focus on “low income countries” is worrying. This is a World Bank classification, which includes just 34 countries, with a national income below £800 a year per person. Any country with a national income above £800 a year per person is regarded as middle income (up-to £9,500 above which countries are classed as high income). 103 countries are classed by the World Bank as middle income. Middle income countries which have had hidden loans in recent years include Republic of Congo, Malaysia and Zambia. The transparency of loans to all governments needs to be improved, not just the most impoverished.